Karen Werner is a doula located in Haydenville MA with over 20 years of experience. I will support you with continuous presence and provide hands-on comfort and massage. Together we will focus on your physical and emotional needs, using relaxation, breathing, positioning and movement techniques to help reduce pain and enhance the labor progress. I support your choices in how you want to labor and give birth. I help you and your partner work as a team during labor and delivery. I was a hospital-based doula at Barnes Jewish Hospital St. Louis for 9 years, during which I attended 75 births. The hospital-trained doulas do everything possible to make the childbirth experience fulfilling. I have been in private practice for many years. My work with clients and their partners exists to uncover the dynamic force that works within each mother to birth a child. My Somatic practice has been largely defined by my work as a Doula. My practice is based in the breath and by using Sensory Awareness in combination with Therapeutic Touch and Meditation. I strive to create a bodily connection infused with openness, responsiveness and trust. My process work is not geared towards expectations, such as fulfilling a preconceived birth plan. My work with clients and their partners exists to uncover the dynamic force, which works in each Mother to birth a child. Traditionally the role of the Doula (Greek for woman helping woman) is to support the clients choices in how they want to labor and birth, give information about childbirth, help the client and her partner work as a team during labor and delivery, act as witness and provide encouraging words and physical comfort during labor. In addition to this my practice is informed by the unique intimacy of an established personal relationship developed during pregnancy and hands on therapeutic touch in concert with conscious breath work provided at clients request. My hands-on therapeutic touch is designed to connect breath with holding patterns in the body that can inhibit movement and identify stress that block awareness of the energetic flow. Using touch, holding and guided breath work I assist the Mother in consciously directing her focus which will prepare her for the stresses of labor and begin to give a foundation for dealing with pain. This hands on work strives to create space for the Mother to consciously release patterns that may inhibit the natural progression of labor. The use of massage, acupressure, making sound, movement and creating opportunities for partners to lovingly assist in giving physical and emotional support during labor are important elements for a productive labor and can activate expansive receptivity to the birth experience. The foundations of my Somatic practice are based on building relationship with the Mother and her partner, and educating the Mother using cognitive exercises that build resilience. Documenting the circumstances shaping the birth give the Doula a unique perspective on infant development. The Doula is the primary witness during the birth process present throughout the birth and after. She can be instrumental in supporting the family throughout the first year of development. Subtle continuous conditions begin in infancy and while doctors are trained to look for disease the Somatic practitioner is trained to look at physical development and adaptations that may hinder proper development. Early hands on somatic intervention with infants combined with parent education can make a real difference in the development of children and may reverse developmental delays and create conditions that allow the body to right itself, a form of self healing. 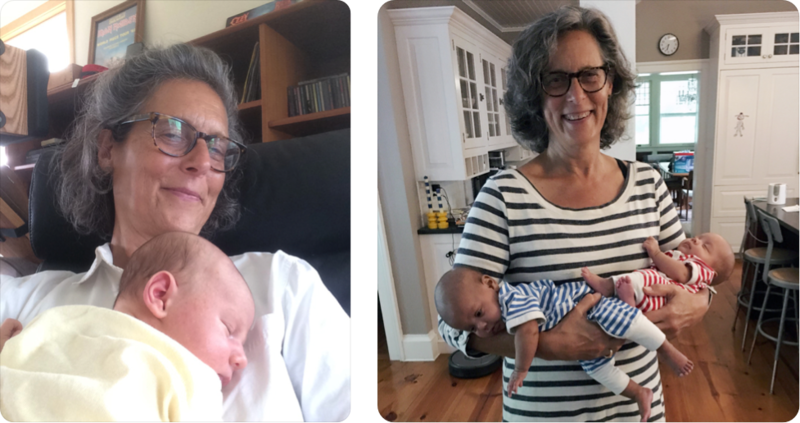 "Karen Werner was my doula when I gave birth to my daughter Marjaan, who was six weeks premature. I also received valuable postpartum support from her during the joyful yet challenging months that followed. In the labor room, Karen was a strong advocate for me and my husband. My labor was long and the doctor had decided to do a vacuum extraction, ignoring our hesitation. Karen stepped into this situation and gave me tremendous strength and confidence and I pushed out my baby with her support. We strongly believe that Karen’s sensitivity and knowledge saved our child from potential harm and we are so grateful for that. Although a strong and happy baby, Marjaan had acid reflux well into the first year and a half of her life. Karen was a wealth of information and provided immense moral and emotional support to our family. She is now a part of our family. I highly recommend her with no hesitation whatsoever to any woman looking for love and encouragement before, during, and after giving birth." "Before giving birth to our daughter, my husband and I took classes in the Bradley Method of natural childbirth. We felt very prepared by these classes, but wanted an experienced person to help us through our first birth. Karen was wonderful for us. Before the birth, she helped me relax with soothing prenatal massage, and encouraged me to cut back hours at work a bit because she could see how much I was exhausting myself. She went to the hospital with us twice because of my starting and stopping labor, and each time I was very glad to have her there to help us make the call about when to go (and when to go back home to rest). Karen's manner is a great combination of mothering, but no-nonsense. I am an introverted person and she was great at reading me. I was worried that with the doctor, a nurse, my mom and my husband all in the room helping me, that a doula would put too many cooks in the kitchen, so to speak. But Karen did a great job of incorporating everyone's suggestions and including everyone in the process. She was the team coordinator, and it really helped to put me at ease. I especially remember Karen's voice at the end, when it was time to push and I was having doubts—she knew exactly how to coach me through it, and rejoiced with us when we held our daughter in our arms—what an amazing feeling. I highly recommend Karen as a doula—her years of experience and calming manner would be an asset to any birthing parents." "I wanted to have caregivers who where willing to support my goal for a natural, homebirth. But I also wanted professionals who would be available throughout and would look out for our health first. I chose to have Karen as my Doula and Dana Albillo as my midwife. Dana, my midwife, took care of my medical needs; but I was also looking for a woman guide to be ‘near’ during this challenging, new moment of my life. In Karen I found nearly on-call experience, intuition, and the right combination of strength and tenderness. Close to my due date, when I had a leak in my waters, it was Karen who rubbed my pressure points and got me into labor. When I was in transition and begged for it to end, it was Karen that reminded me that I was the one in control. When push came to shove (pun intended) it was Karen's voice that I remember telling me in the clearest language the 3 things I needed to do. A few contractions later when I met Baby, it was Karen asking what celebratory meal I wanted her to go out get me. When I thought my baby seemed floppy and weak, it was Karen who came with a discerning eye, laughed gently, and told me that newborns are floppy. During my time in her care, Karen often knew what I needed before I did and she acted with assurance and grace granted by natural talent, years of experience, and true mother’s intuition." Fee schedule and references provided upon request!